This year’s Father’s Day is a special one for me since I am a proud father of two (one isn’t out yet, but in November). It was only yesterday I found out that our second baby is going to be a girl! I didn’t want to express too much emotion over this, being sensitive to what Joshua might interpret from me… but to know we are breaking the ‘all boys’ trend between our families is incredibly sweet. Her name is Savanna, named after a geographic region found in our favorite continent, Africa. Angela and I have been to Africa twice. Angela was employed over a month there so she got to experience living in Maun. We’ve climbed Kilimanjaro to the peak, lounged on hammocks at Zanzibar, camped out in the wild Okavango delta with the hippos, and drove across Namibia to see the red sand dunes. But this year, I am about to embark on a greater adventure, fathering a young boy and a newborn girl. Angela and I at Uhuru Peak! Taking care of a girl will be a very unique experience for me. I’ve grown up with a little brother so I have no sister experience, and haven’t really babysat for girls. We could end up with a tomboy or a girly-girl, but I am ready to embrace whomever she wants to become. I didn’t know who Joshua would become, but he blew away all my expectations. I am sure she will do the same! I no longer find a gift for my dad on Father’s Day, nor give him a call, or take him out to lunch. It’s been 11 years since I seen him or had a conversation with him. No, I am not a bad son and every year it’s very frustrating not to be able to do those things. On July 23rd, 2001 at 4am, I was woken by a phone call from my mom saying my dad wouldn’t get up. I rushed home to see him, just before the paramedics took him away. I had enjoyed a dinner and some TV the night before. I even watched him fall asleep at the TV. For the next few days, I sat in the living room at my mom’s home unsure of life and even my relationship with God… but over time I learned to embrace and cherish the memories I had with my dad. He had died of a sudden cardiac death (heart stopping due to possible arrhythmia). My dad was a humble mechanic since day 1 of my life. He never wanted to become anything more, but was content each and every day knowing he’s helped people get back on the road. For 25 years, he worked at Canadian Tire and has never achieved more than a chief mechanic. Many evenings outside of work he would be working on other people’s vehicles or working on some mechanical invention which he did end up patenting and selling to hospitals (look for medical supply carts that fold up and roll away). When he didn’t do those things, he would be tossing the baseball or watching baseball on TV with me. Everything he did, I wanted to do and I became a carbon copy of him. During my youth, my dad was always there for me. I rode his back when I started to crawl. He taught me how to ride a bike, to throw a ball, to fish, and to fix things. We built a house together and even fell through a ceiling between the joists to the bottom floor… injured but laughing. Twice I had my car(s) breakdown and he would leave work just to help me and somehow be able to find a cheap or free car to replace the old one. He was there for my UBC graduation and he believed in me. 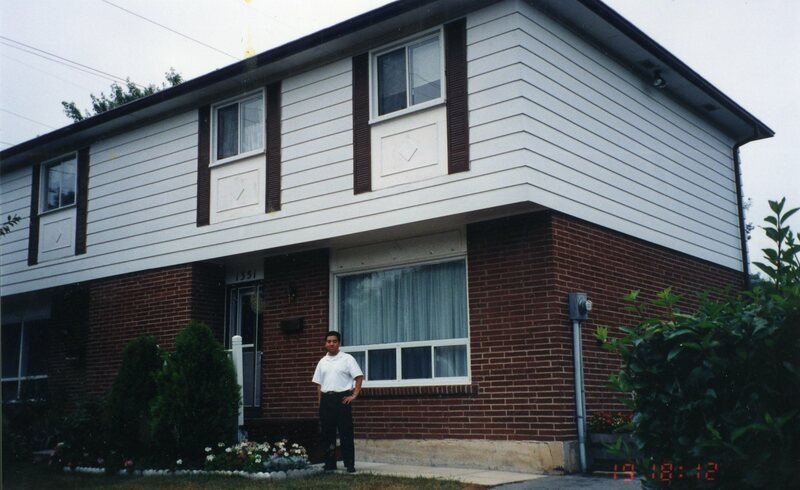 House that I grew up in Toronto. I still have dreams of my dad and I still use his cell phone number. I don’t have a picture of him with me since I know he would look much different today if he was around. But frankly, I am not sure if I would be who I am today if I he had not passed away. Because I was able to reflect on his life, I had become more grateful for what he’s done for me. That has now translated to how I am a father today, and I can only do better. This entry was posted in Uncategorized and tagged Angela, daddy, father, Joshua, Savanna by sushianimator. Bookmark the permalink. Love to make and eat sushi. Animation is fun on the side.